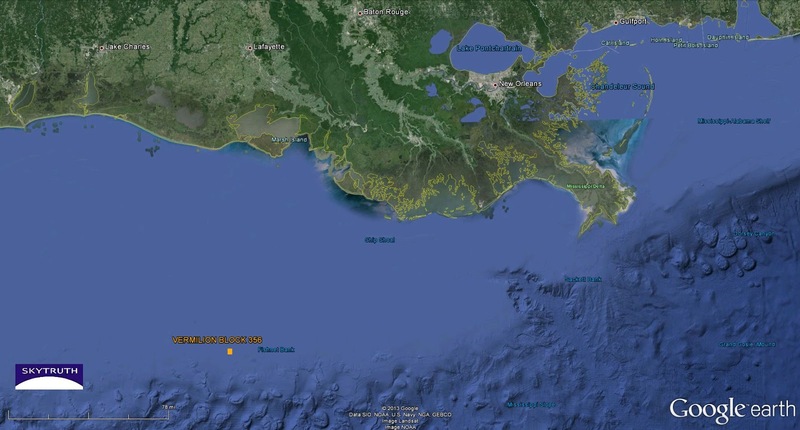 Vermilion Block 356 shown in orange, 93 miles offshore. There is only one platform in this block, operated by EnVen Energy Ventures, LLC, and installed in 2000. You can look it up here. The drill rig, a jackup rig called the Rowan Louisiana, may or may not have been working at this platform. The only information we have so far is from a few brief news articles. If you learn more, please let us know — comment on this blog, on our Facebook page, or send us an email. Many thanks to our stellar volunteers for helping us power through the Moor Frog phase of our FrackFinder mission. With the help of dozens of volunteers we were able to power through 4,140 sites and identify 7,835 ponds around active wellpads. Give yourselves some serious high-fives! BUT, our work is not done. 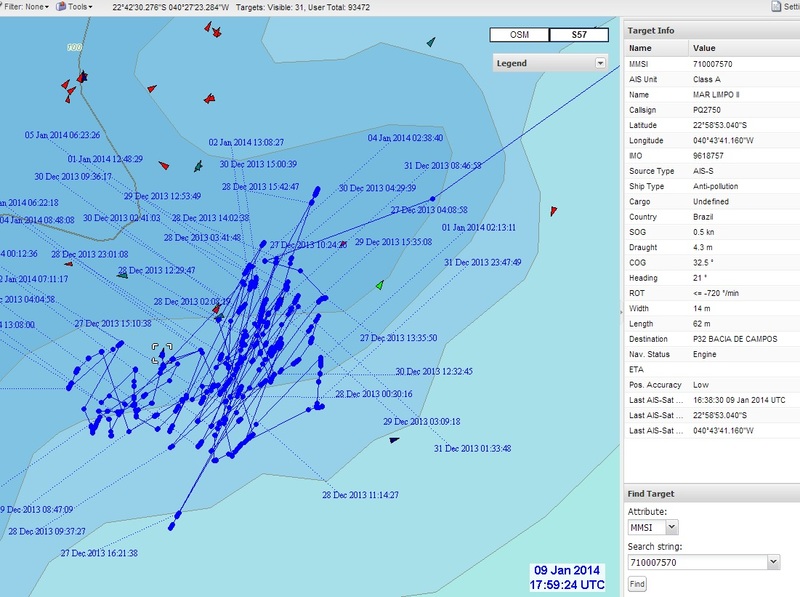 Today, we launch into a NEW PHASE of FrackFinder… Project Dart Frog! So, get your sorting goggles on and recruit some friends and neighbors to help us with the project. Our latest FrackFinder effort, Project Moor Frog was aimed at locating ponds near active wellpads across Pennsylvania’s Marcellus Shale. 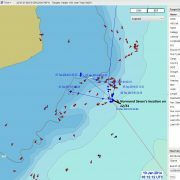 Most phases of FrackFinder build on previous projects, for example, we know where active wellpads based on the results of Project Tadpole. Now we need you to help us sort out which of those ponds are related to fracking, and which aren’t. 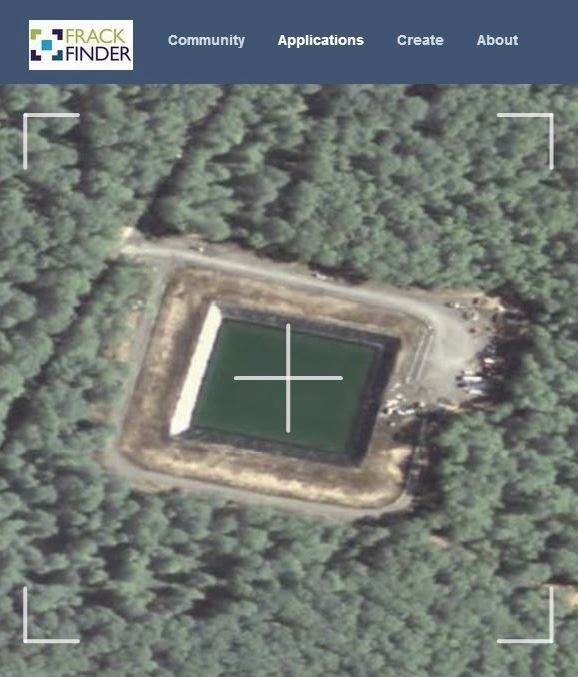 This is one of the ponds skytruthers just like you helped find in Project Moor Frog. Now we need your help to sort out which of these are fracking ponds (like this one) and which ones are naturally occurring or man-made for other purposes like decoration or watering livestock. 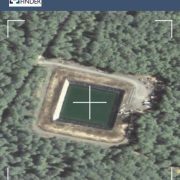 Just to recap for you, FrackFinder PA is a multi-phase effort to map drilling and hydraulic fracturing (fracking) across Pennsylvania using crowd-sourced image analysis of satellite and aerial imagery. We’re asking volunteers like you to help us look through images of fracking sites and tell us what you see. Ultimately, these projects will create a comprehensive map of drilling and fracking in Pennsylvania. After Pennsylvania, our goal is to create this map for the whole United States! This is a project specifically designed to support work we are doing with our partners at the Johns Hopkins Bloomberg School of Public Health. Experts there are planning to use the FrackFinder data YOU produce to study the relationship between fracking and public health issues, but first they need to know where the fracking is! Project Dart Frog is a simple sorting project and can easily be done on any computer or tablet with a decent internet connection. Not sure you’ve got the eyes for this job? Don’t worry! We provide you with a simple tutorial that will put you on the fast track to pond identification. Spread the word. Check it out. Make a difference. 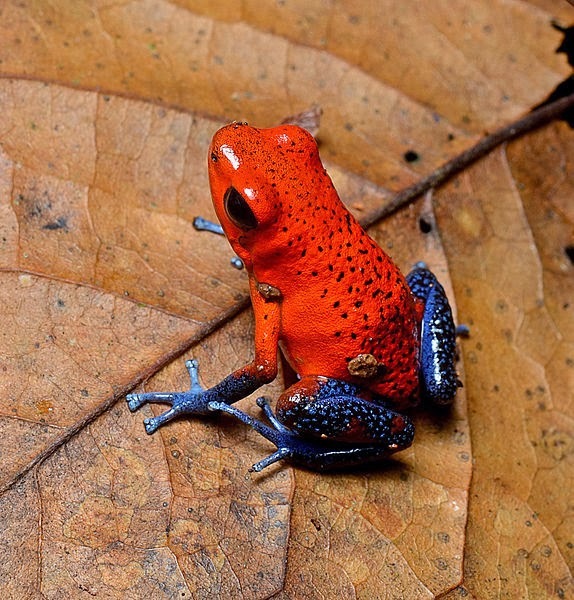 About Dart Frogs: In keeping with our amphibian themed projects, Project Dart Frog invokes colorful little critters like this Strawberry Dart Frog. We thought since we’re asking you sort out the good ponds from fracking ponds, we’d pick a brightly colored family that’s full of red frogs, blue frogs, green frogs, and bad frogs (as in bad for anyone who wants to make a meal of them since they are toxic in the wild). It’s only appropriate, don’t you think? 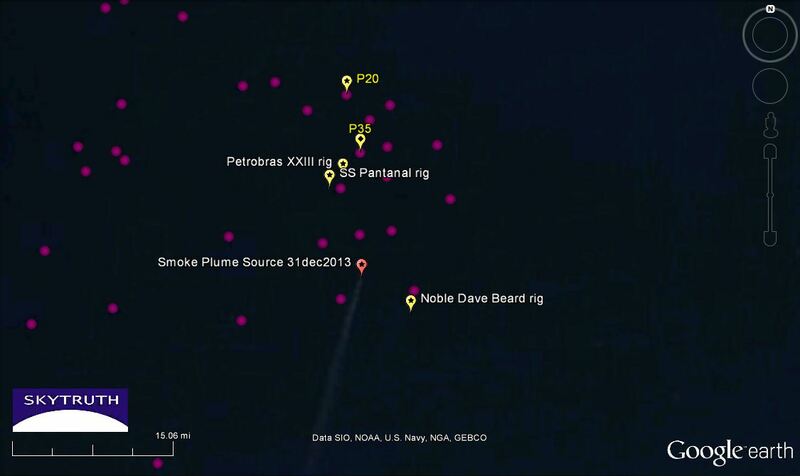 Smoke Plume in Campos Basin off Brazil – Mystery Solved? We may now know what caused the large smoke plume we observed on a December 31 satellite image off the coast of Brazil. We learned that repair operations were being done on a pipeline in the Marlim Sul field between two platforms about 10 miles north of the point of origin of the smoke plume. We’re told it is not unusual for a large volume of flaring to be necessary during a pipeline repair operation. 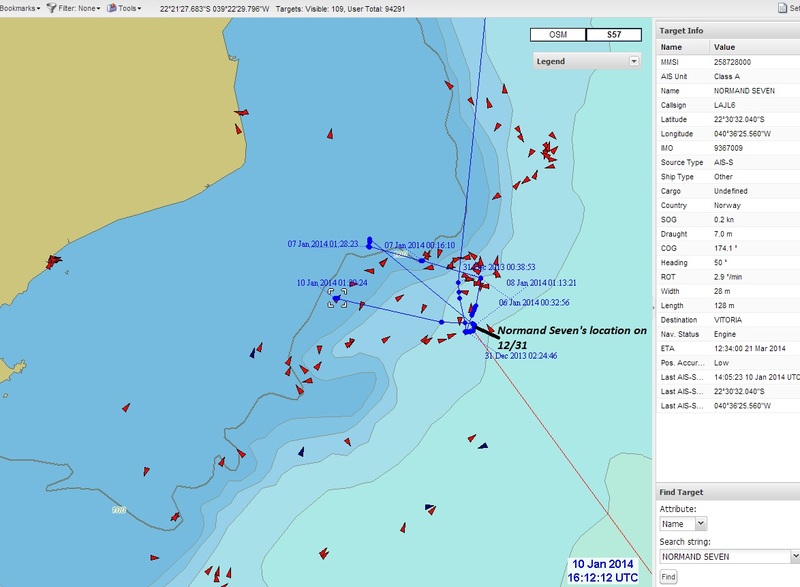 Using satellite AIS data, David spotted a pipelay vessel, the Normand Seven (here’s a painting of the vessel), working in the area on December 31, supporting this information that a pipeline repair project was being conducted. So… one mystery possibly solved. 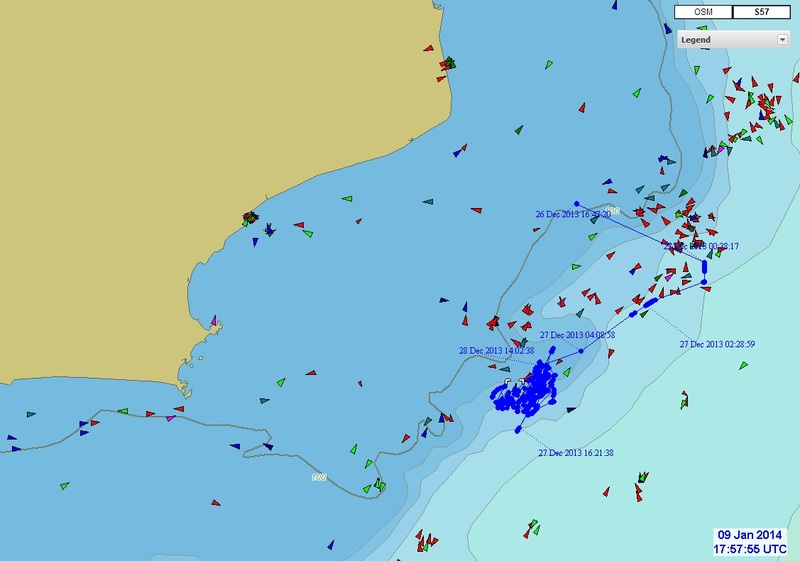 Meanwhile, we’re still wondering about the oil pollution response activity some 45 miles to the southwest. 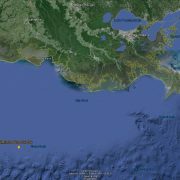 https://skytruth.org/wp-content/uploads/2014/01/SkyTruth-Campos-basin-NORMAND-AIS-track.jpg 861 1174 John Amos /wp-content/uploads/2016/08/test_logo.png John Amos2014-01-10 23:08:002019-02-14 11:06:24Smoke Plume in Campos Basin off Brazil - Mystery Solved? 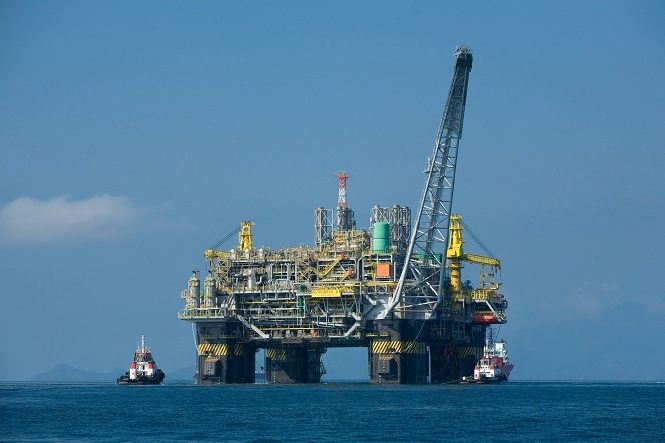 Pollution Response Activity in Campos Basin off Brazil? Detail from December31, 2013 MODIS satellite image showing smoke plume off coast of Brazil in the Campos Basin oil field. Source of smoke plume shown by red marker. Nearby / notable drill rigs and platforms shown by yellow markers. 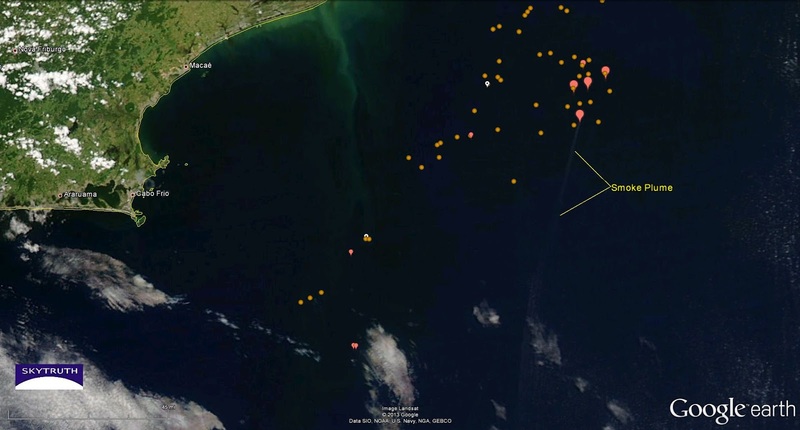 Other oil platforms shown as purple dots. Meanwhile, our investigation has turned up something else of interest. If anyone has information about a possible spill here, please let us know. 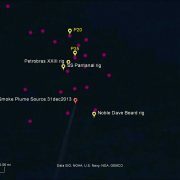 https://skytruth.org/wp-content/uploads/2014/01/SkyTruth-Campos-basin-smoke-plume-MODIS-31dec2013-rigs-platforms.jpg 669 1125 John Amos /wp-content/uploads/2016/08/test_logo.png John Amos2014-01-09 20:18:002019-02-14 11:07:01Pollution Response Activity in Campos Basin off Brazil? MODIS satellite image of Campos Basin, Brazil, showing long plume of smoke emanating from oil production area. Combustion sources identified from nighttime VIIRS satellite data shown by red markers. Image taken December 31, 2013. 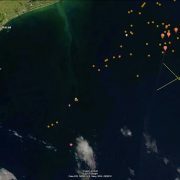 The smoke plume appears to emanate from a point about 2.7 miles north-northeast of Petrobras Platform 51, a big semisubmersible rig in the Marlim Sul field. The VIIRS data indicate the presence of a combustion source at the north end of the smoke plume, and estimate it’s temperature is 1800 degrees Kelvin — this is extremely hot, hot enough to soften steel. The plume visibly extends to the south for at least 146 miles. It’s possible this is just an unusually vigorous gas-flaring event, but we don’t see comparable plumes of smoke from the many other flares detected in the area. We haven’t heard anything but are concerned there may be a fire at a platform or drill rig working at this location. If you have any news, please let us know by commenting on this post and/or emailing us (info@skytruth.org).